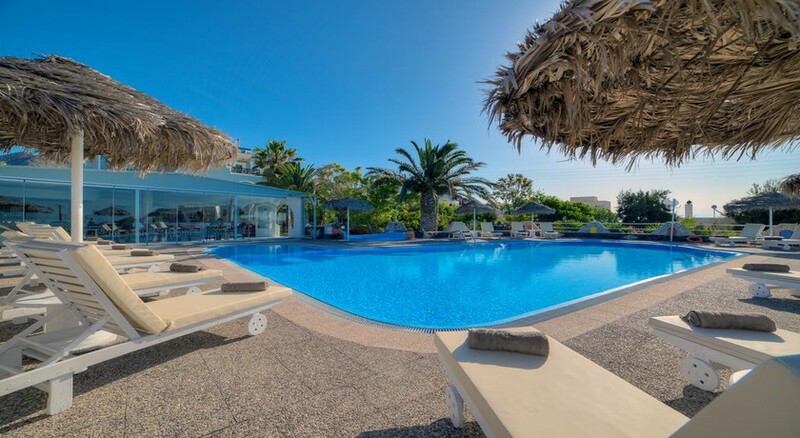 Villa Olympia is a 3-Star beachfront luxury hotel situated close to the Black Sand Beach in Santorini, Greece. The hotel offers luxurious stay to vacationers from all over the world looking for a relaxing holiday in the Cycladic Islands. The hotel houses a large swimming pool. It closely located to the famous Black Sand Beach, aptly named after its volcanic black sand. Villa Olympia has a modern décor and plush interiors with spacious rooms. Some of the rooms here have an additional feature of spa bath, giving the guests a pampered, luxurious holiday. The proximity of the hotel to the beach and the local markets make it an ideal destination for a Greek holiday. 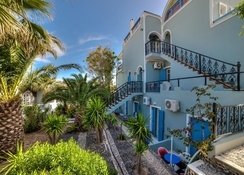 Villa Olympia is located 12km away from the Santorini International Airport, 151km away from the Paros National Airport and 108km from the Naxos Island National Airport. The closest beach is 900m away from the property. The local bus stop is 100m away from the hotel. The local market is 100m away from the hotel. There are many tourist attractions like the Ancient Thera and Kamari's open-air cinema located 2-4km away from the hotel. The hotel can arrange for a cab for their guest to all the commuting required. There are 8 types of rooms based on number of guests. Accommodation options at Villa Olympia include double bedrooms, deluxe double bedrooms, triple bedrooms, junior suites and luxury suites. The rooms can be booked based on requirement of beds, desired view, amenities like Spa bath, among others. 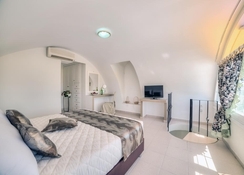 All the rooms of Villa Olympia are equipped with TV, air condition, mini fridge, safe box, free Wi-Fi, hairdryer and essential toiletries. Some of the rooms offer an outdoor bathtub with a view of the sea. The Luxury Suites also come with a hydro-massage on the large balcony with a view of the sea. Some rooms are also equipped with kitchenettes. All the rooms are decorated in earth colours and fabrics with Cycladic motifs giving the architecture a distinct local cutural touch. The colours and the décor of the room are designed to provide a relaxing experience to the guests. All the rooms are cleaned on a regular basis by the house-keeping staff. The guests may enjoy a buffet breakfast by the pool. A specialised menu for breakfast can be served upon request. Light meals are available at the snack bar. The bar on the hotel premises also offers drinks and cocktails. There are many hotels and bars closely located to the hotel. The mini market offers a variety of hotels local and international cuisines. The market is just a 5-minute walk from the hotel. There are plenty of bars and traditional taverns on the black sand Beach which is just 650m away from the Villa Olympia hotel. Some of the hotel rooms have kitchenettes, which allow the guests to indulge in some light cooking. The Black Sand Beach offers a number water sports. The guests can also visit the local tourist attractions like the Ancient Thera and Kamari’s Open-Air Cinema among others. One can also indulge in shopping and experience the local culture of Santorini at the local market which is just 100m away from the hotel. The tour desk can arrange transportation to all the tourist attractions in the vicinity of the Villa Olympia hotel. Activities like diving, canoeing and horse-riding can also be taken up at an additional charge. Stayed here for a wonderful week. The hotel was clean, relaxing and friendly. It is a 20 min walk to the main area, but it's quite nice to be out of the way. The pool is the highlight of the hotel. I think it was a great price and value and if you are out all day exploring anyway it's cosy to come back to after. Many guests I spoke to have came back again and again. A special place for a family holiday. Pool a tad chilly. Villa Olympia is a great place to stay. Lovely rooms, cleaned every day to a very high standard. Buffet breakfast very good, plenty of choice. Pool towels provided, lots of little finishing touches that make your stay special. Staff are very friendly and helpful, nothing is too much trouble. Beach and tavernas 10 minute walk away. Would definitely stay here again if returning to Santorini. The staff were so helpful from start to finish. Answered any question we had about the local area etc. And they went above and beyond what you would expect with the service they provided. Would recommend to anyone. And would go back there in a heartbeat.